Mitogen-activated protein kinases (MAPKs) are a group of serine/threonine kinases which are activated in response to a diverse array of extracellular stimuli and mediate signal transduction from the cell surface to the nucleus. It has been demonstrated that MAPKs are activated by external stimuli including chemotherapeutic agents, growth factors and reproductive hormones in ovarian surface epithelial cells. Thus, the MAPK signaling pathway may play an important role in the regulation of proliferation, survival and apoptosis in response to these external stimuli in ovarian cancer. In this article, an activation of the MAPK signaling cascade by several key reproductive hormones and growth factors in epithelial ovarian cancer is reviewed. Mitogen-activated protein kinases (MAPKs) are a group of serine/threonine kinases which are activated in response to a diverse array of extracellular stimuli, and mediate signal transduction from the cell surface to the nucleus . As illustrated in Fig. 1, three MAPK family including extracellular signal-regulated kinases (ERK1 and ERK2), c-jun terminal kinase/stress-activated protein kinases (JNK/SAPK) and p38, have been well characterized [2–4]. In addition, other MAPK family members, including ERK3, 4 and 5, four p38-like kinases and p57 MAPK have been cloned, but the biological role of these MAPKs is not well understood [2, 4]. The MAPK cascade is activated via two distinct classes of cell surface receptors, receptor tyrosine kinases (RTKs) and G protein-coupled receptors (GPCRs). The signals transmitted through this cascade can cause an activation of diverse molecules which regulate cell growth, survival and differentiation. ERK1 (p44 MAPK) and ERK2 (p42 MAPK) activated by mitogenic stimuli are a group of the most extensively studied members, whereas JNK/SAPK and p38 are activated in response to stress such as heat shock, osmotic shock, cytokines, protein synthesis inhibitors, antioxidants, ultra-violet, and DNA-damaging agents [5, 6]. MAPK family members are directly regulated by the kinases known as MAPK kinases (MAPKKs), which activate the MAPKs by phosphorylation of tyrosine and threonine residues [2, 4, 6]. At least seven different MAPKKs have been cloned and characterized [2, 4]. 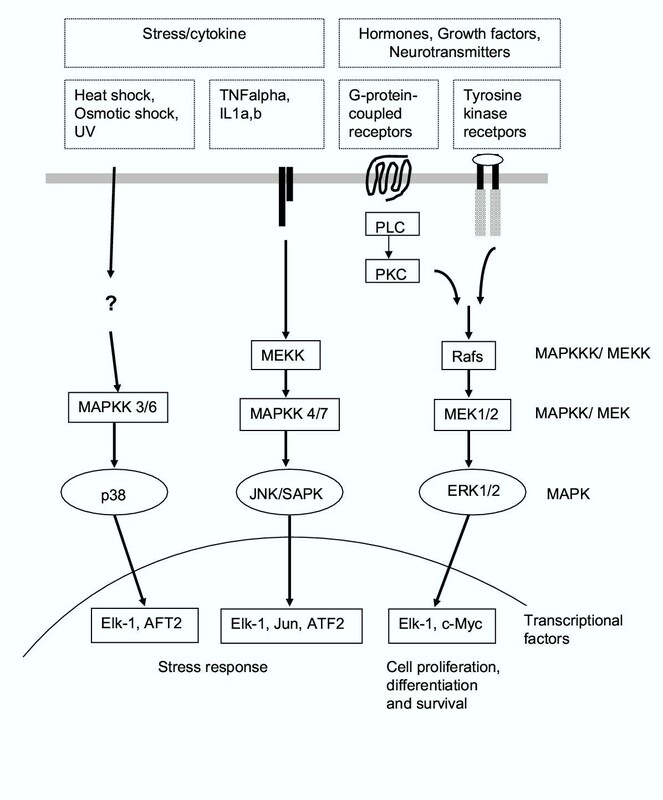 The first MAPKKs cloned were MAPK/ERK kinase 1 and 2 (MEK 1/2), which specifically activate ERKs. MKK3 and 6 specifically activate p38, whereas MKK5 stimulates the phosphorylation of ERK5. The MKK4 and 7 are known to activate JNK. The MAPKKs are activated by a rapidly expanding group of kinases called MAPKK kinases (MAPKKKs), which activate the MAPKKs by phosphorylation of serine and threonine residues [4, 6]. These include Raf-1, A-Raf, B-raf, MAPK/ERK kinase 1–4 (MEKK1-4), apoptosis-stimulating kinase-1 (ASK-1), and mixed lineage kinse-3 (MLK-3). The MAPKKKs may be activated by kinases known as MAPKKK kinases (MAPKKKKs), one of which is p21-activated kinase (PAK). In addition to these kinases, low molecular weight GTP-binding (LMWG) proteins regulate the activity of MAPKKKs and MAPKKKKs [2, 4]. There are several different families of LMWG proteins, two of which include the Ras (N-Ras, K-Ras, and H-Ras) and Rho (Rac 1, 2 and 3, Cdc42 and Rho A, B and C) families. The activated MAPKs phosphorylate a large number of both cytoplasmic and nuclear proteins, exerting their specific functions. For example, activated ERK1/2 phosphorylate ternary complex factor (TCF) proteins such as Elk-1 and SAP-1, which form transcriptional complexes with serum response factor (SRF) in the promoter region of early response genes (e.g. c-fos, egr-1, junB) and thereby regulate their expression . As shown in Fig. 1, many of these nuclear proteins, as a result of their ability to modulate expression of other proteins, are potential candidates for critical factors involved in the cellular response to stimuli. The MAPK signaling transduction pathways. It appears that the majority of ovarian tumors arise from the ovarian surface epithelium (OSE), which is a simple squamous-to-cuboidal mesothelium covering the ovary . As mentioned earlier, the MAPK cascade can be activated via both RTKs and GPCRs, which include the receptors of growth factors, gonadotropins and gonadotropin-releasing hormones (GnRH). In ovarian cancer cells, MAPKs are activated and regulated by cisplatin , paclitaxel , endothelin-1  and GnRH  suggesting that the MAPK signaling pathway plays an important role in the regulation of proliferation, survival and apoptosis in response to these external stimuli in ovarian cancer. In this review, we summarize the activation of the MAPK and its signaling cascade induced by hormones, growth factors and chemotherapeutic agents in normal and (pre)neoplastic OSE cells. There is increasing evidence that gonadotropin-releasing hormone (GnRH) and its agonists (GnRHa) may play a critical role in the inhibition of cell proliferation in gynecological cancers including ovarian and endometrial cancers. However, their biological mechanism remains to be uncovered. The GnRH receptor (GnRH-R) belongs to the family of GPCRs. MAPK has been implicated in the antiproliferative effect of GnRHa in CaOV-3 ovarian cancer cell line . Treatment of CaOV-3 cells with GnRHa resulted in an activation of ERK at 5 min, reached the highest activation at 3 h and sustained until 24 h, whereas GnRHa had no effect on the activation of the JNK. In addition, the ERK kinase was also activated and an increase in phosphorylation of son of sevenless (Sos), and Shc was observed following GnRHa treatment. Treatment with an inhibitor of mitogen-activated protein/ERK kinase, PD98059 reversed the antiproliferative effect of GnRHa and the GnRH-induced dephosphorylation of the retinoblastoma protein. These results indicate that an activation of ERK may play a role in the antiproliferative effect of GnRHa . In our laboratory, we have shown that an agonist of GnRH (D-Ala6)-GnRH, induced a biphasic pattern of ERK-1/-2 activation in OVCAR-3 cells (Fig. 2). 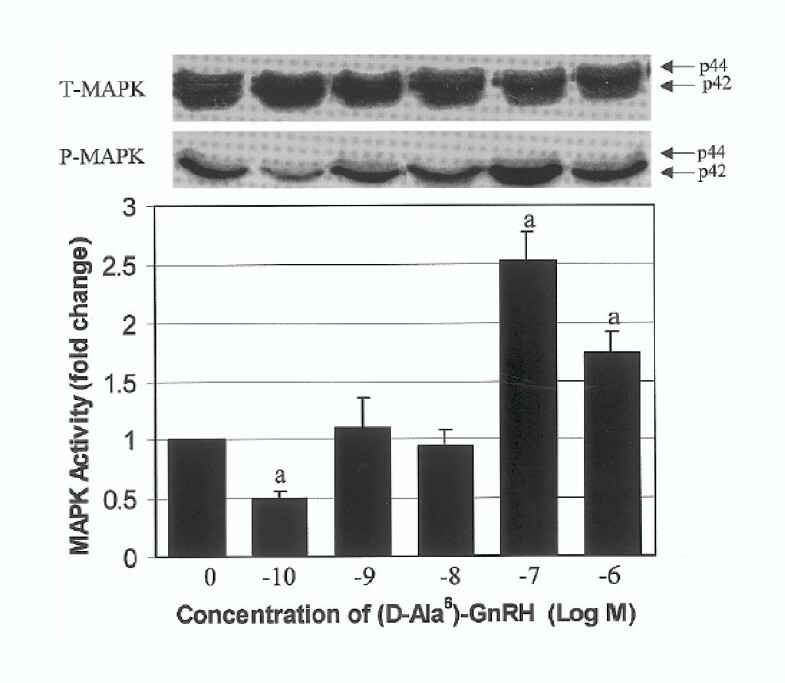 A low concentration of GnRHa (10-10 M) resulted in a significant decrease of MAPK activity, whereas high concentrations (10-7 and 10-6 M) induced an activation of MAPK pathway in ovarian and placental cells . It is of interest to note that GnRH signaling appears to involve ERK-1/-2 phosphorylation through the activation of adenylyl cyclase and PKC in rat luteinized ovarian tumors . An involvement of gonadotropins, follicle-stimulating hormone (FSH) and luteinizing hormone (LH), has been proposed in the progression and metastasis of ovarian cancer. Expression of FSH receptor (FSH-R), a member of the GPCRs family, has been demonstrated in normal OSE , ovarian inclusions and epithelial tumors , implicating a potential role of FSH in these cells. Treatment with FSH resulted in a growth-stimulation in ovarian cancer cells in a dose- and time-dependent manner in vitro [16, 17]. Despite these findings, the precise molecular mechanism of FSH in terms of growth stimulation and intracellular signaling in ovarian cancer remained unknown. In a recent study, we have investigated the involvement of MAPKs in the mechanism of the growth-stimulatory effect of FSH in pre-neoplastic OSE cells . Treatment with FSH (10, 100 and 1,000 ng/ml) resulted in the MAPK activation of immortalized OSE (IOSE-29) cells as shown in Fig. 3. The stimulatory effect of FSH in the cellular proliferation and MAPK activation was completely abolished in the presence of PD98059, a MEK inhibitor (Fig. 3). 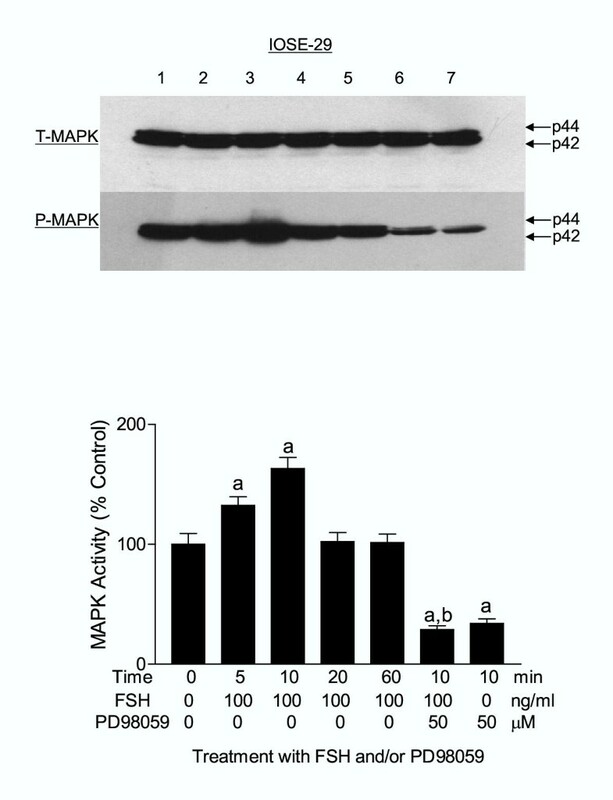 In IOSE-29 cells, treatment with FSH significantly increased MAPK activity at 5–10 min, and an activated MAPK declined to control level after 20 min in these cells (Fig. 4). In addition, treatment with FSH resulted in substantial phosphorylation of Elk-1, the Ets family transcriptional factor . These results support the hypothesis that the MAPK cascade is involved in cellular function such as growth stimulation in response to FSH in pre-neoplastic OSE cells. Similar to FSH, adenosine triphosphate (ATP) has been implicated in the regulation of cell proliferation and activation of MAPK pathway in ovarian cancer cells. ATP binds to heterotrimeric G protein-coupled P2 purinoceptors and extracellular ATP has been suggested to play a role in cellular proliferation and intracellular calcium concentrations (Ca2+) in ovarian cancer cells [19, 20]. 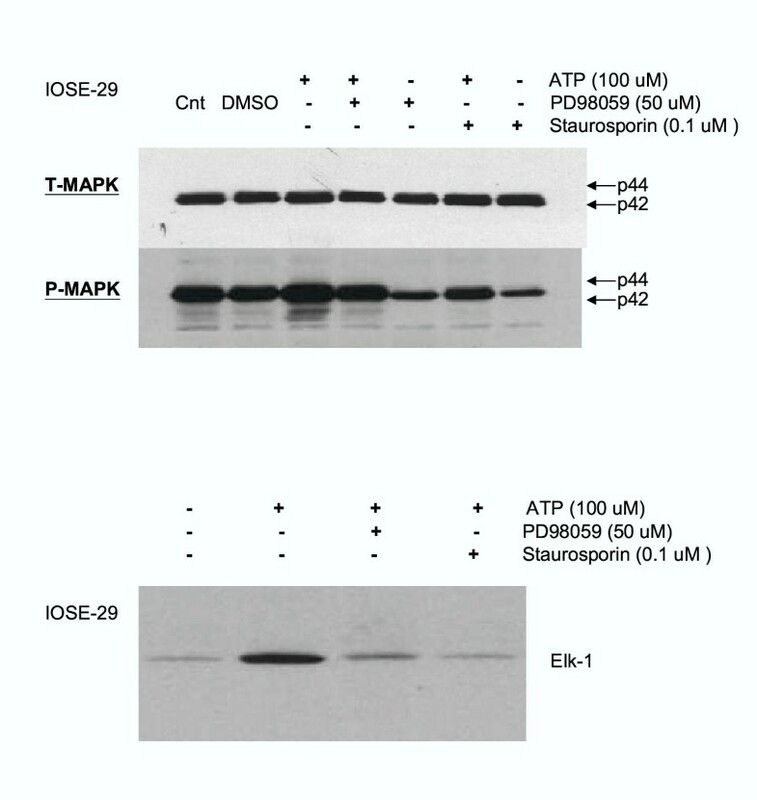 Our recent results indicated that treatment with ATP resulted in an activation of ERK-1/-2 in IOSE-29 cell line as seen Fig. 5. 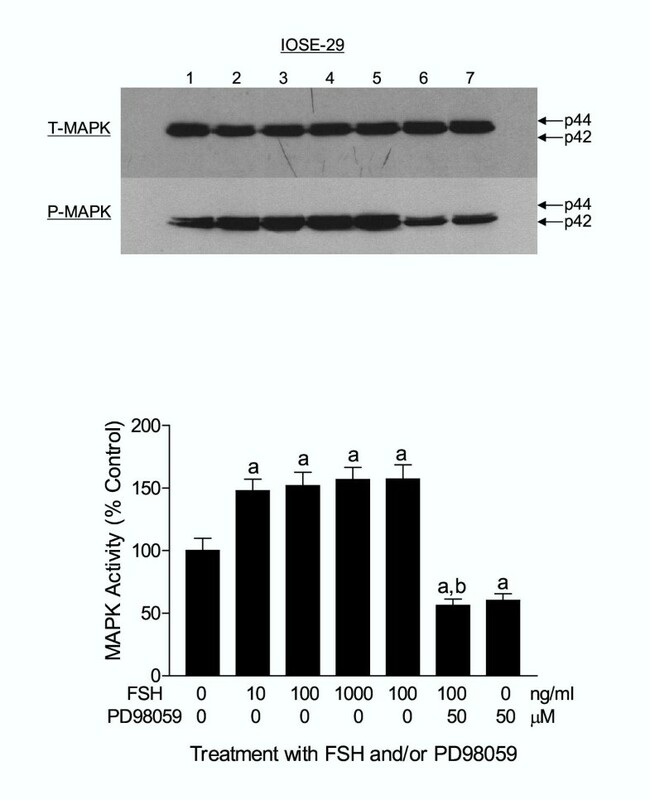 The stimulatory effect of ATP in the cellular proliferation and MAPK activation was completely abolished in the presence of PD98059 and staurosporin (a PKC inhibitor), suggesting that the growth stimulatory effect of ATP is mediated via PKC-dependent MAPK activation in pre-neoplastic OSE cells (Fig. 5). Treatment with ATP resulted in substantial phosphorylation of Elk-1, further implicating the MAPK cascade in the growth stimulatory effect of ATP in pre-neoplastic OSE cells . Endothelin-1 (ET-1) is a potential autocrine regulatory factor in ovarian cancer. Treatment of OVCA 433 ovarian cancer with ET-1 resulted in a phosphorylation of ERK-2 and mitogenic responses. The epidermal growth factor receptor (EGF-R)/ras-dependent pathway may contribute to the activation of MAPK/ERK-2 and mitogenic signaling induced by ET-1 in these cells, suggesting that ET-1 induced activation of MAPK is mediated in part by signaling pathways that are initiated by transactivation of the EGF-R . As autocrine regulators, lysophosphatidic acid (LPA) and sphingosine-1-phosphate (S1P) have been demonstrated to activate MAPK kinase (MEK) and p38 MAPK via AKT pathway in HEY ovarian cancer cells. The kinase activity and S473 phosphorylation of Akt induced by LPA and S1P required both MEK and p38 MAPK, and MEK is likely to be upstream of p38 in these cells, suggesting that the requirement for both MEK and p38 is cell type- and stimulus-specific . In rhesus ovarian surface epithelial cells in culture, treatment with extracellular calcium induced an activation of MAPK in the response to cell proliferation in these normal cells . Human interleukin-8 (IL-8) rapidly activated ERK-1/-2 pathway via stimulation of the CXCR-1/2 receptors . By using inhibitors such as genestein and herbimycin A, tyrosine kinases have been shown to be involved in the IL-8 activation of ERK-1/-2 in SKOV-3 cells, suggesting an important cross-talk between the chemokine and growth factor pathways in the migration and proliferation in ovarian cancer cells . In addition to ERK1/2, the JNK pathway has been suggested to play a role in the cell proliferation and apoptosis in ovarian cancer. For instance, treatment with tumor necrosis factor (TNF) alpha activated ERK1/2 at 10–20 min, and a maximum threefold induction of ERK1/2 activity was observed after 1 min of treatment . Inhibition of TNF alpha-induced ERK1/2 activity by PD98059 was associated with induction of apoptosis in the TNF alpha-resistant cell line UCI 101. Inhibition of TNF alpha-induced ERK1/2 activity was accompanied by a subsequent transient increase in TNF alpha-induced JNK1 activity. These results indicate that ERK1/2 activity may modulate cellular response to TNF alpha. A balance between ERK1/2 and JNK1 activation may be pivotal in the cellular growth and apoptosis response to TNF alpha . Cisplatin has been widely used as a chemotherapeutic agent to treat ovarian cancers, although its use is somewhat limited because of cisplatin-resistance. The molecular mechanism of cisplatin-induced biological effect in ovarian cancer is not well understood. Cisplatin caused a late and prolonged induction of both ERK1/2 and JNK1 activity in a dose-dependent manner, whereas no significant difference was observed in p38 activity in SKOV-3 cells . These results suggest that ERK and other signal transduction pathways may play a role in response to cisplatin and be important for the development of new strategies to enhance the therapeutic use of platinum drugs. In cisplatin-resistant CaOV-3 and cisplatin-sensitive A2780 ovarian cancer cells, cisplatin induced an activation of both ERK and JNK in distinct time and dose patterns . Cisplatin-induced JNK activation was neither extracellular and intracellular Ca2+-dependent nor protein kinase C-dependent, whereas cisplatin-induced ERK activation was extracellular and intracellular Ca2+-dependent and protein kinase C-dependent . In regard to the regulation of apoptosis by cisplatin, it has been shown that cisplatin activated a robust apoptotic pathway involved in the activation of JNK and p38 MAPK in cisplatin-sensitive ovarian cancer cells, whereas it fails to elicit the response in cisplatin-resistant 2008/C13 cells . In cisplatin-resistant cells, the proteolytic activation of MEKK1 by caspase-3 is deficient, suggesting that inadequate caspase-3 processing and MEKK1 activation may induce a cisplatin-resistant phenotype . The activation of two MAP kinases, JNK1 and ERK1/2 was compared in the cisplatin-sensitive ovarian carcinoma cell line A2780 and the cisplatin-resistant cell lines CP70 and C200 . Distinct patterns of cisplatin-induced JNK1 and ERK1/2 activation were observed in the cell lines with different levels of cisplatin sensitivity, and inhibition of cisplatin-induced ERK1/2 activation appeared to enhance sensitivity to cisplatin in both cisplatin-sensitive and cisplatin-resistant cell lines. It appears that these MAPK pathways may be important in the cisplatin-resistance in ovarian cancer, which can be used as a potential therapeutic strategy . More recent data indicate that cisplatin differentially induced JNK and p38 pathways, with the cisplatin-sensitive cells showing prolonged (8–12 h) activation and the cisplatin-resistant cells showing only transient (1–3 h) activation of JNK and p38 . In addition, the inhibition of cisplatin-induced JNK and p38 activation blocked cisplatin-induced apoptosis and persistent activation of JNK resulted in an increase in the phosphorylation of c-Jun transcription factor, which stimulated a transcription of an immediate downstream target, a death inducer Fas ligand (FasL) in cisplatin-sensitive cells. Thus, it appears that the JNK-c-Jun-FasL-Fas signaling pathway plays an important role in the regulation of cisplatin-induced apoptosis in ovarian cancer cells, and the duration of JNK activation may be essential in the determination of survival or apoptosis in ovarian cancer cells . Taxol, a microtubule stabilizer, is a useful therapeutic agent for ovarian cancer treatment. Treatment with taxol resulted in an activation of ERK1/2 and p38 MAPK in human ovarian carcinoma cells with distinct kinetics . The low concentrations of taxol (1–100 nM) activated ERK1/2 within 0.5–6 h, whereas a longer exposure (24 h) at low concentrations abrogated ERK1/2 phosphorylation/activation. Higher concentrations (1–10 μM) of taxol resulted in a sharp inhibition of ERK1/2 activity, whereas same concentrations activated p38 kinase at 2 – 24 h, indicating that the activation of MAPK may be dependent on the dose and exposure time of chemotherapeutic agent . Interestingly, treatment with paclitaxel resulted in a phosphorylation of p70S6K (T421/S424) and this paclitaxel-induced phosphorylation requires both de novo RNA and protein synthesis via multiple signaling pathways including ERK1/2 MAP kinase, JNK, PKC, Ca(++), PI3K, and mammalian target of rapamycin (mTOR). Thus, paclitaxel is able to induce p70S6K phosphorylation and exert its antitumor effect via multiple signaling pathways, especially inhibition of p70S6K . The expression levels of kinases have compared in normal, immortalized and neoplastic OSE cells . The expression levels of casein kinase II (CK2), p38 MAPK, cyclin-dependent kinase, and the phosphatidylinositol 3-kinase (PI3K) effectors Akt2 and p70 S6 kinase (S6K) were several-fold higher in neoplastic OSE than in normal OSE, whereas no significant difference was observed in the expression of ERK1/2 . Interestingly, c-Jun NH2-kinase but not PI3-K resulted in telomerase activity. An inhibition of JNK by a specific inhibitor reversed telomerase activity, while the expression of JNK induced an activation of a reporter gene fused to the hTERT promoter sequence at transcriptional level, indicating that JNK plays a critical role in the regulation of telomerase activity and may provide possible therapeutic approaches to ovarian cancer . In addition, the correlation between BRCA1 and stress-associated MAPK has been proposed in ovarian cancer cells . The JNK, an apoptotic signaling pathway, was induced by overexpression of BRCA1, and BRCA1 enhanced the signaling pathways that sequentially involved H-Ras, MEKK4, JNK, Fas ligand/Fas interactions, and caspase-9 activation . Recently, it has been shown that gamma-synuclein is dramatically up-regulated in the vast majority of late-stage breast and ovarian cancers and its overexpression may be related with enhanced tumorigenicity. Furthermore, overexpression of gamma-synuclein resulted in a constitutive activation of ERK1/2 and down-regulation of JNK1 in response to environmental stress signals, including UV, arsenate and heat shock . The cross-talk between the MAPK signaling pathway and multi-drug resistant protein MDR-1 has been suggested in terms of sensitivity or resistance to chemotherapy. A constitutive activation of the ERK1/2 pathway was observed, whereas the level of active JNK and p38 remained unchanged in the taxol resistant cells. Inhibition of the ERK1/2 pathway by specific inhibitors, UO126 or PD098059, resulted in a re-sensitization in the taxol resistant cells . There is some evidence that the MAPK pathway may play a role in the metastasis of ovarian cancer. Treatment of ovarian cancer cells with MEK1 inhibitors, U0126 and PD98059, induced a significant suppression of the MMP-9 secretion activated by fibronectin (FN), suggesting an importance of these signaling molecules as a chemotherapeutic target for cancer to prevent metastasis . The urokinase-type plasminogen activator receptor (u-PAR) has been implicated in tumor progression, and the expression of this gene is strongly up-regulated by phorbol 12-myristate 13-acetate (PMA), a PKC activator. Treatment of the u-PAR-deficient ovarian cancer OVCAR-3 cells, which contain low JNK activities, with PMA resulted in a rapid (5 min) activation of JNK pathway. This finding suggests that the PMA- or c-Ha-Ras-dependent stimulation of u-PAR gene expression requires a JNK1-dependent signaling module . There is increasing evidence that the three well-characterized members of the MAPK family, ERK1/2, JNK/SAPK and p38, play an important role in the regulation of proliferation, survival and apoptosis in ovarian cancer in response to the external stimuli including hormones, growth factors, cytokines and chemotherapeutic chemicals. The signaling pathways by which hormones such as FSH, ATP and GnRH exert their effects in the regulation of cell proliferation and apoptosis in ovarian cancer cells are proposed in Fig. 6. As well, MAPK pathways may contribute to the metastasis and chemoresistance of ovarian cancer. A better understanding of the MAPK and other signaling pathways in normal and neoplastic OSE will provide new insights for the development of novel therapeutic approach to ovarian cancer. 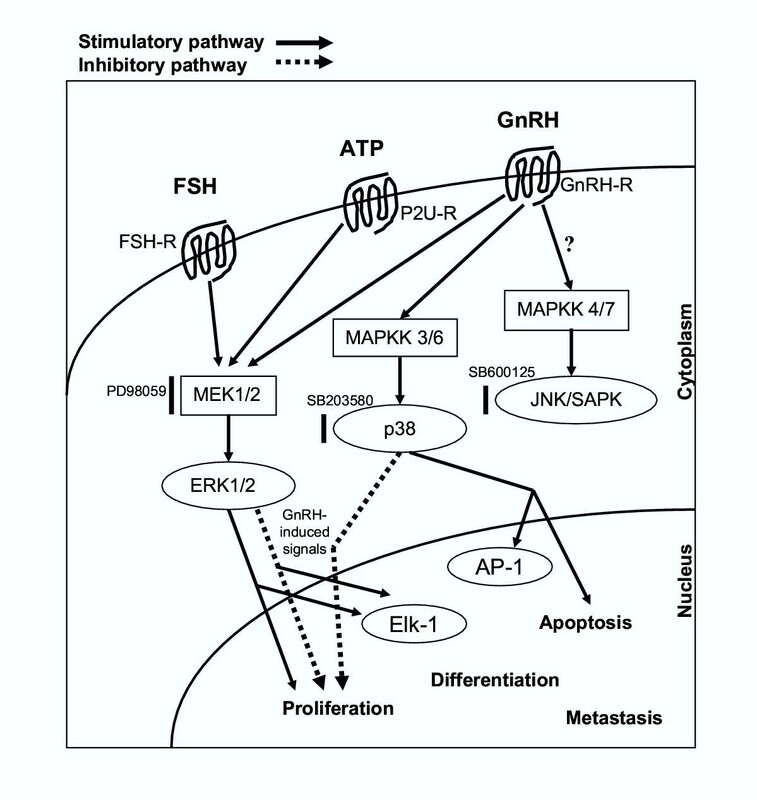 Activation of the MAPK signaling pathway by FSH, ATP and GnRH in ovarian cancer. PCKL is the recipient of a Distinguished Scholar Award from the Michael Smith Foundation for Health Research. This work was supported by the Canadian Institutes of Health Research.